A septic tank system, also known as a drain field, is comprised of several porous tanks, and various pipes. This type of drain system distributes the excess waste water throughout a field. This water contains various chemicals such as phosphorous, nitrogen, as well as bacteria, that can act as a fertilizer. Excess water that enters the drain field will be eliminated through various natural processes including percolation into soil, uptake by a plant’s roots, evaporation, and transpiration either from plants or groundwater/surface water. When new wastewater enters a septic tank, it displaces the water already contained. Although carefully designed, septic tank problems do arise, more routinely in older systems. The process of organic material breakdown by bacteria causes the septic tank to produce gas. To prevent the gas from entering the house through the house sewer pipe, most plumbing systems require multiple traps throughout the house drain and house sewer system. Instead of flowing back into the house, the gas remains inside the system of tanks. The gases produced by the breakdown of waste can pose fatal problems if not vented properly, or if one is exposed without a proper breathing apparatus. Fatalities do occur each year by workers entering septic systems to perform maintenance without proper protection, ventilation, or safety harnesses. Most residential septic systems are designed with two tanks. The first tank, a smaller tank, holds solids. There is an overflow pipe, which leads to a second larger tank. The larger tank holds overflow of fluids. Each of the two tanks has weep holes, allowing for the waste water to seep into a surrounding layer of crushed stone, which is surrounded by filter fabric. The waste water then is absorbed by the surrounding soil. Part of a septic systems design is predicated on the surrounding soil conditions; known as percolation. In NYC a septic tank must be installed at least 15′ away from a home. This ensures the tank is a safe distance away for both structural and health reasons. When tree roots find their way into the tank, they can do a lot of damage. Inlet pipes can get blocked, and this will stop the pipes from working. Cutting away the roots is usually a temporary solution because they will grow back pretty quickly. In such a case, you have to hire professional plumber to treat the issue by using chemicals in an environmentally-friendly way. 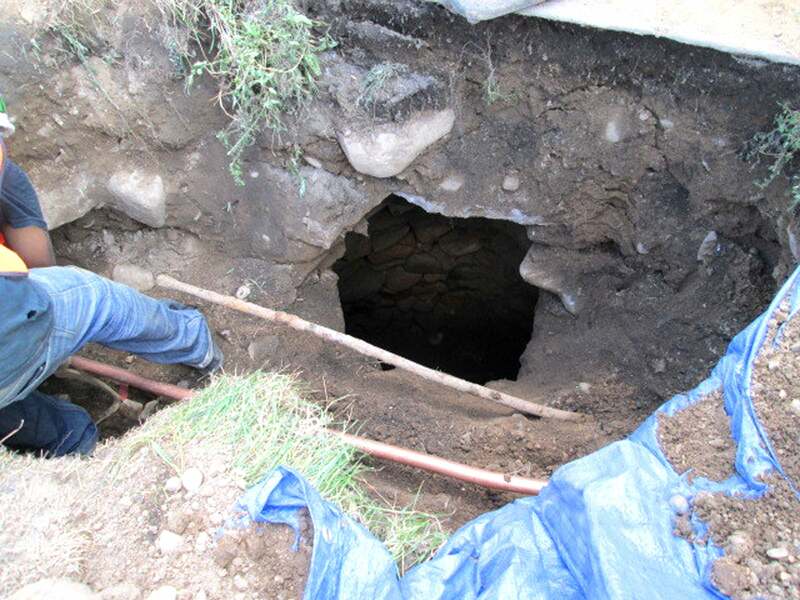 In some cases excavation and pipe repair, or replacement, may be needed. A septic tank does have outlets and a drain field to get rid of excess water. But solid materials in the floor will continue to accumulate that eventually needs to be pumped out. When solid materials reach the inlet pipe, plumbing appliances will drain very slowly. Pumping a septic tank is a job best left to professionals who are licensed waste removers. Part of the design of a typical septic tank are easily accessible clean-outs on the top cover of the tank. This allows for easy access for pumping. Even when you have P-traps connected to the sewer pipe, strong odors can still come out of septic tanks especially if you use chemicals that kill bacteria in the tank. To correctly address the real culprit of strong odors, call a professional to do the inspection. A sewer smell outside the house, or inside a home, is both a nuisance and a potential health hazard. It is not something to ignore, or think of as a normal occurrence. A sewer smell is a sure sign of a plumbing malfunction. In most cases a licensed plumber should be called. Septic tanks can collapse for a variety of reasons. This is one of the most serious septic tank problems that can occur. That is why never place a driveway, building, or swimming pool above a septic tank. Covers can crack, or slowly disintegrate, and are most definitely not designed to be load bearing. Sometimes the walls of the cesspool itself can collapse. This is particularly a danger in older tanks that were constructed out of cinder blocks, instead of precast concrete rings. When a septic system is disconnected, it is vitally important to properly fill in the tanks using clean fill. Once a tank is emptied of water, it is much more prone to collapse. That is because the pressure of the surrounding soil is no longer counter-acted by the water inside the tank. Regular maintenance and proper user behaviors will keep your septic tank working properly for years without major issues. You still have to pump out occasionally, but there will be no expensive repairs and problems with your septic tank systems. • Too much water in the septic tank can disrupt the delicate biological balance. Discharging more water than the system can handle causes the system to back up. • Chemicals such as drain cleaners or household detergents are considered normal, and they will not kill bacteria inside the tank. Stronger chemicals such as pesticides, motor oil, solvents, and paint should not enter septic tank. Dispose of such chemicals to waste collection facilities. • Some materials do not decompose in the septic tank. For examples coffee grounds, diapers, cigarette butts, facial tissues, and towels. Non-decomposable materials should not go into a septic tank. • Grease is unfriendly to drain pipes, including those connected to a septic tank. It can easily accumulate and block the flow of wastewater both inside the pipes. Grease can coat the inside of the tank itself, and prevent water from escaping from the tank as well. • Do not park or drive vehicles over a septic tank, as it can collapse the pipes, the tank, and compacts the soil. Most people prefer to use a shared public sewer system. This is because they don’t have to do regular maintenance and repair damages; all responsibilities to keep the system running properly fall on local government. Compared to a public sewer, a septic tank is more likely to fail. In addition, heavy rain or a large amount of sewage can easily overwhelm a septic system. If septic tank problems are not treated properly, they can contaminate groundwater, and therefore be dangerous to the general public’s health.